The archery portion of the Naadam Festival held in July each year. 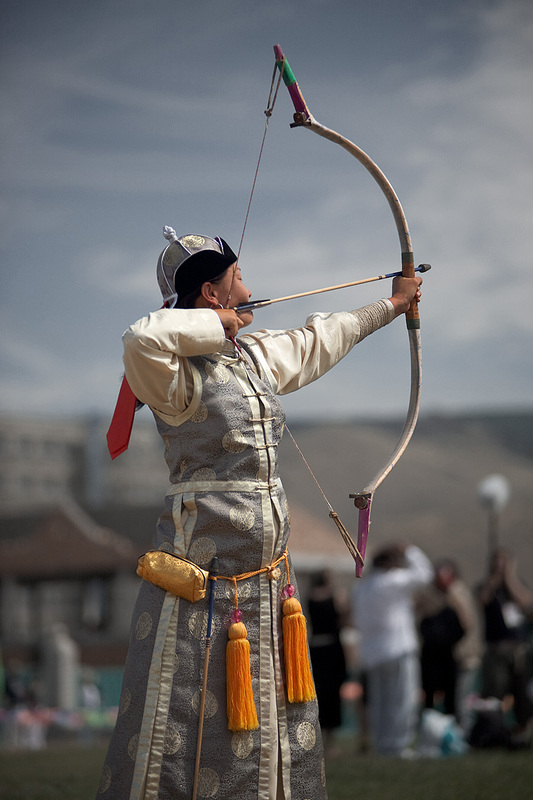 A female archer in elegant Mongolian dress aims to topple a small wall of marked blocks from over half a football field away. The skill demonstrated by the archers in the competition is absolutely amazing as they more often than not hit the center portion of the marked blocks. What's even more amazing, to me at least, is that they arc the arrows at the target as you can see from the position of this archer's bow, yet still manage to hit the target consistently. The other sports held at the Naadam Festival are wrestling, horse racing, and anklebone shooting, which involves flicking an actual anklebone (or shagai) of a sheep at a small target.